A tour guide of 1888 said that "The Royal Hotel occupies the site of the Old Bath Hotel. It is the finest and most imposing looking building in Matlock. It was originally commenced as a company, passed into the hands of Major [John F] Wieland. ... Its grounds are remarkably picturesque, and the private entrances are through rockeries and conservatories". Apparently, when the Royal Hotel was roofless and in rather a sorry state Major Wieland happened to be passing through the village. A large sum of money had already been spent on the hotel's construction (mentioned by Bryan, below), but the Major took pity on the building's desolate appearance and spent some £30,000 to finish the project. 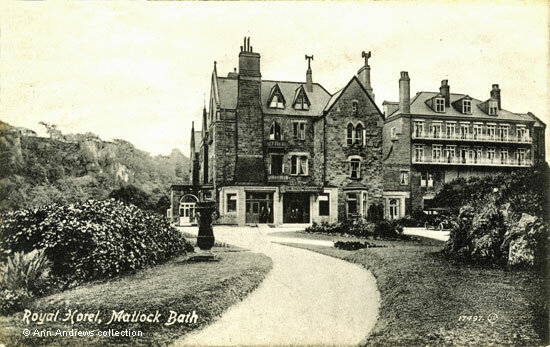 Matlock Bath celebrated when the hotel, initially called the Great Hotel, finally opened on 2 September 1878. The shopkeepers decorated their windows and bunting was put up; it was hoped that the new hotel would boost their trade. "At noon inhabitants of Matlock Bath presented Major Wieland with a congratulatory address, wishing him success. At 4p.m. the terrace was thrown open for dancing to the delightful strains of Matlock Prize Band. During the evening the lower parts of the hotel were opened for viewing and many took the opportunity to look. About 8p.m. the rocks opposite the hotel and the river were illuminated with chinese lanterns, arranged by Mr. Ratcliffe". A decade later Kelly's Directory describes the hotel as follows: "The Royal hotel occupies an eminence on the side of the Old Bath, and is a substantial building of stone, surrounded by beautiful grounds affording highly attractive views of the immediate neighbourhood ; it has been enlarged and fitted with baths of every description. The great mineral spring adjoining it yields 10,000 gallons an hour". Major Wieland later offered a considerable sum to the Matlock Bath Improvements Association and was prepared to pay for a band to attract visitors to the village. The outcome was the Pavilion and Gardens Company which went on to lose around £20,000. Benjamin Bryan did not mince his words when writing his "History": "The adjoining Royal Hotel was another unsuccessful company undertaking. The building, projected in 1866, was designed for use as a hydropathic establishment, but the company's capital becoming exhausted while it was in course of erection, it stood unfinished for a number of years. In 1878, it was completed and opened as an hotel, and as such it now carries on. It has a dining room 70 feet in length, and 100 bed and associated chambers, besides a suite of hydropathic baths and a modern tepid water swimming bath. A second Hydropathic Company was projected in June, 1882, with a capital of £30,000, in 6,000 shares of £5 each. It was proposed to purchase the building and contents for £25,000. All the directors, of whom there were nine, were, with one exception, strangers to the place. This property is also now in private hands". Major Wieland must have been greatly disappointed that his investment in Matlock Bath was not a success. He was buried at Hampstead in 1893. During the First War, between 1917 and 1919, the Hotel was used as a Convalescent Home by Canadian Officers. In 1928 the hotel was offered for sale following the death of the then owner, Mrs. Hocker (later Mrs. Sarah Louise McArthur). It was bought by Mr. R. J. Bray who then spent a considerable sum refitting the 100 bedroom hotel and building new baths. Tragedy struck in 1929 shortly after the hotel reopened; there was a disastrous fire on 1st April (Easter Monday). The alarm was raised between 10 and 11p.m. whilst the Bank Holiday Ball was in progress. Flames had been seen coming from the front attic where the resident staff had their quarters and the fire spread rapidly. The local fire brigade was first on the scene, though there was a delay whilst they located the water, and they eventually ran their hoses up from the River Derwent. Other fire brigades in the district were also called, with the Chesterfield contingent arriving at midnight. The flames were visible for some distance and the police were also at the scene, holding back crowds of onlookers. When the fire broke out the hotel had been full; over 100 people were in residence as well as the additional guests at the Ball. Those staying at the hotel were transferred to other hotels in the area, managing to take their belongings with them, whilst the staff were found lodgings. Sadly for the owner, the extent of the damage rapidly became apparent and it was impossible to save the hotel. The top floors of the older part of the hotel and their contents were destroyed, including the property of the 40 or so staff who lived in the hotel. Other areas were severely damaged and much of the building had to be demolished, though the west wing, shown on the image below, remained for about thirty years. When the land was offered for sale about eight years afterwards, the site had been cleared and the west wing reconditioned. Postcard of the Royal hotel, showing the extension (west wing). There are some members of staff standing in the two doorways. There is another postcard of the Royal Hotel, posted in 1901 in the "Just" images section of tis site. The Peak Hydro, Buxton: Canadian Hospital. The Canadians had opened another hospital in Buxton year earlier before they took over the Royal Hotel. 1. 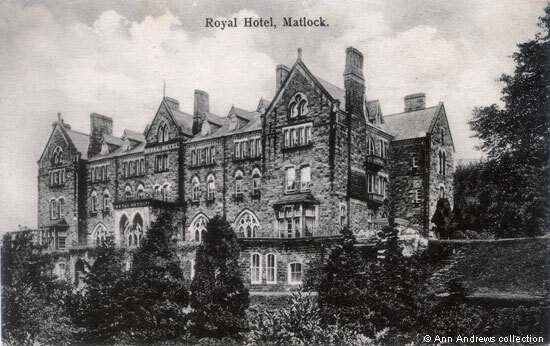 Top postcard: Royal Hotel, Matlock". One of the Boots Cash Chemist "Pelham" Series. Where the stamp is to go are the words: Affix half penny stamp inland. Penny stamp Foreign. Printed in Prussia. Exact date difficult as the card is not postmarked but possibly about 1910. 2. Second postcard: "Royal Hotel, Matlock, Bath". Valentine's Series, No.17497. British Manufacture. Postcards in the collection of, provided by and © and research by and © Ann Andrews. "Black's Tourist Guide to Derbyshire" (1888) pub. Adam and Charles Black, Edinburgh. The sum spent on the Royal Hotel varies. The Guide mentions the figure of £20,000, but other sources say more was spent. "Derbyshire Times and Chesterfield Herald", 22 July 1893. Major Wieland owned a country house and a farm in Buckinghamshire. His wife had pre-deceased him. "Derbyshire Times and Chesterfield Herald", 7 September 1878. Matlock Bath. Opening of the New Great Hotel. Bryan, Benjamin (1903) "History of Matlock - Matlock, Manor and Parish" London by Bemrose & Sons, Limited. The adjoining property he refers to is the Old Pavilion and Gardens. Beresford, Charles "The Bath at War, A Derbyshire Community and the Great War" (2007). Country Books/Ashridge Press. ISBN 978 1 901214 91 8. Several chapters are devoted to the time the Canadians spent in Matlock Bath. "The Times", 1 Mar 1928. "The Times", 2 Apr 1929. The former owner, Mrs. Hocker (Mrs. McArthur when she died), passed away 23 February 1927. She died intestate, leaving a large estate ("The Times", 16 Jun 1927). "The Times", 3 Apr 1929. Mr. Bray, by then living in Bournemouth, offered the site at a bargain price ("The Times", 11 Jan 1936). On 27 May 1937 the site went to auction ("The Times", 18 May 1937).